American Kenpo, also known as Kenpo Karate, is an updated system of martial arts based on modern-day street fighting that applies logic and practicality. It is characterized by the use of quick and powerful strikes delivered from all of the body's natural weapons, powered by rapid stance transitions, called "shifting." Beginners are introduced to basic attack responses, which comprise a larger system taught through scripted scenarios, which allow instructors a platform to share concepts and principles Ed Parker emphasized in his teachings. Moroccans, ancient names Spanish: Moros and English: Moors and Moorish People are a Maghrebi ethnic group inhabiting or originating from Morocco that share a common Moroccan culture and Maghrebi ancestry. The overwhelming majority of Moroccans are of Arab-Berber descent; however, many identify as Arabs or Arabized Berbers. Mir met UFC matchmaker Joe Silva at a Brazilian jiu-jitsu (BJJ) school. Silva saw potential in Mir and suggested that he compete in mixed martial arts. Mir made his professional debut against Jerome Smith at HOOKnSHOOT: Showdown on July 14, 2001. Mir won the bout by unanimous decision after two rounds. He won his second fight by triangle choke in the first round, against Dan Quinn at IFC Warriors Challenge 15 on August 31, 2001. HOOKnSHOOT was a mixed martial arts promotion based in the Evansville, Indiana, United States. It was one of the first MMA organisations in the United States to allow Women's MMA. Dan Quinn is a retired American professional mixed martial artist, boxer, and former collegiate football player. Quinn is notable for his advocacy of Stevia as a performance-enhancing substance and fat burner. UFC 34: High Voltage was a mixed martial arts event held by the Ultimate Fighting Championship at the MGM Grand Garden Arena in Las Vegas, Nevada on November 2, 2001. Roberto "Spider" Traven is a retired Brazilian mixed martial artist whose fighting style is based in Brazilian Jiu-Jitsu and submission wrestling. He was a sporty person growing up, it took him 16 years to find Brazilian Jiu Jitsu, but straight away he picked up tuition with one of the most highly decorated coaches of all time, Romero Cavalcanti AKA “Jacaré”. His natural ability for BJJ was clear from the get-go and the fact that he was obstinate made a recipe for a good fighter. Training 3 times per day alongside other historical figures such as Fabio Gurgel, Leo Vieira, Jamelão and many others, Traven managed to reach the grade of black belt within 4 years, an almost record breaking time frame in BJJ. UFC 11: The Proving Ground was a mixed martial arts event held by the Ultimate Fighting Championship on September 20, 1996, at the Augusta Civic Center in Augusta, Georgia. The event was broadcast live on pay-per-view in the United States, and later released on home video. Mir faced Ian Freeman in London, England, at UFC 38: Brawl at the Hall on July 13, 2002. Despite several leglock attempts by Mir, Freeman achieved side control four minutes into the first round and landed numerous punches and elbows to Mir's head. A time out was called due to a cut on Mir's face. After Freeman separated, the referee signaled to Mir to stand back up and stopped the fight after Mir struggled to do so. Ian William Freeman is a retired English mixed martial artist who was the Cage Rage World Heavyweight Champion and the final Cage Rage British Light Heavyweight Champion. He was the first British person to fight in the UFC, as well as the first person to beat Frank Mir, temporarily halting the young star's rise to Mixed Martial Arts superstardom, as Mir later went on to become UFC Heavyweight Champion. UFC 38: Brawl at the Hall was a mixed martial arts event held by the Ultimate Fighting Championship. It took place at the Royal Albert Hall in London, United Kingdom, on July 13, 2002. The event was seen live on pay-per-view in the United States, and was later released on home video. A leglock is a joint lock that is directed at joints of the leg such as the ankle, knee or hip joint. A leglock, which is directed at joints in the foot, is sometimes referred to as a foot lock and a lock at the hip as a hip lock. Leglocks are featured, with various levels of restrictions, in combat sports and martial arts such as Sambo, Brazilian Jiu-Jitsu, catch wrestling, mixed martial arts, Shootwrestling and submission wrestling, but are banned in some sports featuring joint locks such as judo. Mir then faced Tank Abbott at UFC 41 on February 28, 2003. Mir submitted Abbott with a toe hold in 46 seconds. On June 26, 2003, Mir fought Wes Sims at UFC 43: Meltdown . Mir won by disqualification at 2:55 of the first round after Sims stomped on Mir's jaw following a slam escape of an armbar attempt by Mir. They would rematch at UFC 46: Supernatural on January 31, 2004. Mir won by knockout at 4:21 of the second round. David Lee Abbott is an American retired mixed martial arts fighter, professional wrestler, and author. He currently hosts his own podcast series titled "The Proving Ground with Tank Abbott." Abbott is perhaps best known for being an icon in the early stages of mixed martial arts and the UFC, but has also competed in the PRIDE Fighting Championships, Strikeforce, EliteXC, and Cage Rage. He has described his fighting style, which he developed brawling in the bars and streets of Huntington Beach, California, as "Pit Fighting". Abbott was the first fighter to regularly wear what would be known as traditional MMA gloves in the UFC. He also authored a novel titled Bar Brawler. UFC 41: Onslaught was a mixed martial arts event held by the Ultimate Fighting Championship on February 28, 2003, at the Boardwalk Hall in Atlantic City, New Jersey. The event was broadcast live on pay-per-view in the United States, and later released on DVD. Mir was scheduled to fight kickboxer Antoni Hardonk at UFC Fight Night 9 on April 5, 2007, but had to drop out due to a shoulder injury. He faced Hardonk at UFC 74 and won via kimura at 1:17 of the first round. At the end of the bout, Mir walked to the cameras pointing at himself saying "I'm back!". Frank's wife Jennifer was shown on the replay screaming and crying with joy when Frank secured the kimura and the fight was stopped. "I wish I could make the statement that 'the odds were against me, but you never quit.' It was not true. I wanted to give up." "A lot of individuals are so worried about being politically correct. I'd rather go ahead and say what's on my mind than to sit there and come up with some PC 'Oh, the guy is a great fighter, and I have a lot of respect for him.' If I don't mean it, why is it even coming out of my mouth? ... I want to fight Lesnar. I hate who he is as a person. I want to break his neck in the ring. I want him to be the first person that dies due to Octagon-related injuries. That's what's going through my mind." "I had a strong inclination that he Nogueira was not going to tap, so I took a deep breath and you guys saw what happened. I was being a little too reactionary. When he caught me with the right hand, at that point, it turned into a war. I started to move around, and he wanted to play jiu-jitsu with me. I’m pretty good on the ground." Mir was scheduled to face Alistair Overeem on November 16, 2013, at UFC 167. However, the pairing was moved to February 1, 2014, at UFC 169. Mir lost the fight via unanimous decision. Loss 18–12 Fedor Emelianenko TKO (punches) Bellator 198 April 28, 2018 1 0:48 Rosemont, Illinois, United States Bellator Heavyweight Grand Prix Quarterfinal. Win 18–9 Todd Duffee KO (punch) UFC Fight Night: Mir vs. Duffee July 15, 2015 1 1:13 San Diego, California, United States Performance of the Night. Win 17–9 Antônio Silva KO (punch and elbows) UFC Fight Night: Bigfoot vs. Mir February 22, 2015 1 1:40 Porto Alegre, Brazil Performance of the Night. Loss 16–6 Junior dos Santos TKO (punches) UFC 146 May 26, 2012 2 3:04 Las Vegas, Nevada, United States For the UFC Heavyweight Championship. Win 16–5 Antônio Rodrigo Nogueira Technical Submission (kimura) UFC 140 December 10, 2011 1 3:38 Toronto, Ontario, Canada Submission of the Night. Loss 13–5 Shane Carwin KO (punches) UFC 111 March 27, 2010 1 3:48 Newark, New Jersey, United States For the interim UFC Heavyweight Championship. Loss 12–4 Brock Lesnar TKO (punches) UFC 100 July 11, 2009 2 1:48 Las Vegas, Nevada, United States UFC Heavyweight Championship unification bout. Win 12–3 Antônio Rodrigo Nogueira TKO (punches) UFC 92 December 27, 2008 2 1:57 Las Vegas, Nevada, United States Won the interim UFC Heavyweight Championship. Win 11–3 Brock Lesnar Submission (kneebar) UFC 81 February 2, 2008 1 1:30 Las Vegas, Nevada, United States Submission of the Night. Win 8–1 Tim Sylvia Technical Submission (armbar) UFC 48 June 19, 2004 1 0:50 Las Vegas, Nevada, United States Won the UFC Heavyweight Championship. Later stripped of the title due to injuries suffered in a motorcycle accident. Antônio Rodrigo Nogueira, better known as Minotauro or Big Nog, is a retired Brazilian mixed martial artist. He competed in the heavyweight division of the Ultimate Fighting Championship (UFC), where he is a former Interim UFC Heavyweight Champion. He is the twin brother of UFC fighter Antônio Rogério Nogueira. Nogueria rose to prominence in the Japanese promotion Pride Fighting Championships, where he was the first Pride Heavyweight Champion from November 2001 to March 2003, as well as a 2004 PRIDE FC Heavyweight Grand Prix Finalist. He is one of only four men to have held championship titles in both Pride Fighting Championships and the Ultimate Fighting Championship. Mark Richard Hunt is a New Zealand mixed martial artist and former kickboxer of Samoan descent, currently living in Sydney, Australia. Hunt competes in the Ultimate Fighting Championship (UFC) and was the winner of the 2001 K-1 World Grand Prix. He is known as "King of Walk-Offs" by walking away and stopping attacks before the referee officially ends the match. Andrei Valeryevich Arlovski, nicknamed The Pitbull, is a Belarusian mixed martial artist, actor and former UFC Heavyweight Champion. He has also competed for Strikeforce, WSOF, Affliction, EliteXC, ONE FC and M-1 Challenge. He currently fights in the UFC Heavyweight division. As of March 13, 2019, he is #15 in official UFC heavyweight rankings. Rashad Anton Evans is an American retired mixed martial artist. Evans started his professional career in 2003, he was the Heavyweight winner of The Ultimate Fighter 2 and is also a former UFC Light Heavyweight Champion. Antônio Rogério Nogueira, also known as Minotouro is a Brazilian mixed martial artist currently signed with the UFC. He is the twin brother of Antônio Rodrigo Nogueira, the "Minotauro", earning Rogério the nickname "Minotouro". A proficient amateur boxer, he was the 2006 and 2007 Brazilian Super Heavyweight Champion. He also won a bronze medal in the 2007 Pan American Games. Vladimir Vladimirovich Matyushenko is a retired Belarusian mixed martial artist who fought in the Light Heavyweight division. He has competed for Bellator MMA, UFC, Affliction, Jungle Fight, and is the former IFL Light Heavyweight Champion. Cheick Guillaume Ouedraogo, more commonly known as Cheick Kongo, is a French heavyweight mixed martial artist and former kickboxer who fights in Bellator MMA. A professional MMA competitor since 2001, he has also competed for the UFC. As of April 21, 2019, he is #11 in the world rankings by Sherdog, and by fightmatrix. UFC 81: Breaking Point was a mixed martial arts (MMA) event held on February 2, 2008 by the Ultimate Fighting Championship (UFC) at the Mandalay Bay Events Center on the Las Vegas Strip. Shane Bannister Carwin is an American former mixed martial artist who competed in the Heavyweight division of the Ultimate Fighting Championship (UFC). He is a former Interim UFC Heavyweight Champion. Roy Nelson is an American mixed martial artist who competes in the Heavyweight division of Bellator MMA. A professional competitor since 2004, he formerly competed for the UFC, EliteXC, the IFL, BodogFIGHT, and was the winner of The Ultimate Fighter: Heavyweights. Nelson is also the former IFL Heavyweight Champion, competing under Ken Shamrock and the Lion's Den. Nelson is widely regarded as possessing one of the greatest chins of all time. Ryan DuWayne Bader is an American mixed martial artist. He is currently signed with Bellator MMA, where he is champion in both the Heavyweight and Light Heavyweight divisions. Prior to signing with Bellator, Bader competed for the Ultimate Fighting Championship in the Light Heavyweight division. There, Bader achieved success as a top 5 Light Heavyweight contender and he obtained a UFC record of 15-5. He was a cast member and winner of The Ultimate Fighter: Team Nogueira vs. Team Mir. He is currently ranked the #2 Light Heavyweight and the #8 pound for pound fighter in the world by MMAjunkie.com. He is the first fighter to hold belts in two divisions simultaneously in Bellator history. His nickname is Darth Bader, which refers to Star Wars antagonist character Darth Vader. Stefan Jaimy Struve is a Dutch mixed martial artist who competed as a heavyweight in the Ultimate Fighting Championship (UFC). At 7'0", he is the tallest fighter on the roster. UFC 100 was a mixed martial arts event produced by the Ultimate Fighting Championship (UFC) on July 11, 2009, in Las Vegas, Nevada. 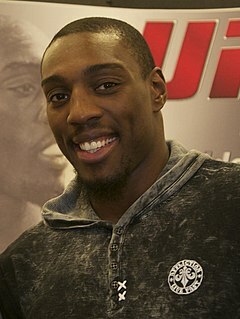 Phil Kwabina Davis is an American mixed martial artist who currently competes as a Light Heavyweight for Bellator MMA. Davis is the former Bellator Light Heavyweight World Champion. UFC 140: Jones vs. Machida was a mixed martial arts event held by the Ultimate Fighting Championship on December 10, 2011 at the Air Canada Centre in Toronto, Ontario, Canada. 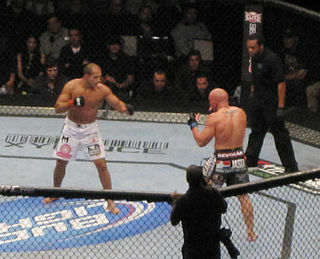 It was the penultimate event for the UFC in 2011. The event featured eight bouts televised internationally, seven preliminary bouts aired on cable in the United States and Canada, and three preliminary bouts streamed live on Facebook. UFC 146: dos Santos vs. Mir was a mixed martial arts (MMA) pay-per-view event (PPV) promoted by the Ultimate Fighting Championship (UFC) on May 26, 2012 at the MGM Grand Garden Arena in Las Vegas, Nevada. The main card featured five MMA bouts which were shown on PPV, as well as seven preliminary bouts which were shown on FX, and Facebook. This was the first time in UFC history that the main card featured all heavyweight bouts. It was the twelfth UFC event of 2012. ↑ "Fight Card - UFC Fight Night Mir vs. Duffee". UFC.com. Retrieved July 17, 2015. 1 2 Nissi Icasiano. "Frank Mir wants to be part of UFC Fight Night Manila". rappler.com. Retrieved February 12, 2015. 1 2 "Frank Mir - Official UFC Fighter Profile". UFC.com. Retrieved February 24, 2015. 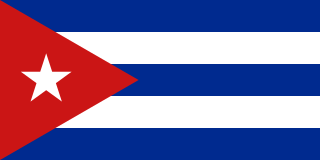 ↑ "A cuban in the UFC". www.ufc.com. May 11, 2011. ↑ "Mixed Martial Arts Results" (PDF). Nevada State Athletic Commission. May 28, 2011. Archived from the original (PDF) on July 25, 2011. Retrieved July 20, 2012. 1 2 "Frank Mir to make pro wrestling debut at Josh Barnett's Bloodsport event WrestleMania weekend". mmajunkie.com. Retrieved January 23, 2019. ↑ "UFC Fight Night 61 post-fight facts: Frank Mir further adds to heavyweight record books". mmajunkie.com. February 23, 2015. ↑ Staff (July 16, 2015). "UFC Fight Night 71 post-fight facts: Frank Mir sets record for first-round finishes". mmajunkie.com. Retrieved July 16, 2015. ↑ "History in the making: Frank Mir breaks Antonio Rodrigo Nogueira's arm at UFC 140". mmamania.com. May 26, 2012. ↑ "Frank Mir". Usadojo.com. Archived from the original on March 4, 2016. Retrieved December 21, 2015. ↑ Brett Okamoto. "UFC's Frank Mir: Then and Now". LasVegasSun.com. Retrieved December 21, 2015. 1 2 3 "Prep wrestling coach recalls high school career of Frank Mir". LASVEGASSUN.com. July 7, 2009. Retrieved August 19, 2009. ↑ BJJ Heroes. "Roberto Traven". Bjjheroes.com. Retrieved December 21, 2015. ↑ "The Mir Lock (2nd and 3rd videos down)". Submissions101.com. Retrieved March 12, 2012. ↑ "Pete Williams professional MMA record". Sherdog.com. Retrieved March 24, 2009. ↑ "UFC 48 - Payback". Sherdog.com. Retrieved December 21, 2015. 1 2 Meltzer, Dave. "UFC 48: Snapped in half". sports.yahoo.com. Retrieved December 21, 2015. ↑ Grilz, Jon (December 11, 2008). "UFC Fight for the Troops—Razak Al-Hassan: AAAAAHHHHH!". bleacherreport.com. Archived from the original on December 20, 2008. Retrieved January 2, 2009. ↑ Hunt, Loretta. "Ufc Heavyweight Champion Mir Suffers Broken Femur In Motorcycle Accident; Speaks From Hospital Bed". ↑ "UFC 51 - Super Saturday". Sherdog.com. Retrieved December 21, 2015. ↑ "UFC Strips Mir of Heavyweight Belt, Arlovski New Champion". Sherdog.com. August 13, 2005. Retrieved July 7, 2007. ↑ "Frank Mir 'thankful' for motorcycle accident". usatoday.com. March 15, 2010. ↑ "UFC 57 - Liddell vs. Couture 3". Sherdog.com. Retrieved December 21, 2015. ↑ Cheshire, Robert (March 15, 2007). "Dan Christison speaks on signing with IFL, cornering Couture". MMAfighting.com. Archived from the original on August 21, 2008. Retrieved January 2, 2009. ↑ DiSanto, Michael (December 17, 2008). "Heavyweight Breakdown: Nogueira vs Mir". UFC.com. Archived from the original on December 22, 2008. Retrieved January 2, 2009. ↑ "Brandon Vera Loses Title Shot Due to Contract Dispute". Bleacherreport.com. Retrieved December 21, 2015. ↑ "UFC 65 "Bad Intentions" Play-by-Play". Sherdog.com. Retrieved December 21, 2015. ↑ "Brandon "The Truth" Vera – SubFighter Fight Finder". Subfighter.com. Retrieved January 2, 2009. ↑ Pishna, Ken (March 10, 2007). "Mir out of UFC Fight Night due to shoulder injury". MMAWeekly.com. Retrieved July 7, 2007. ↑ Sherdog.com (August 25, 2007). "UFC 74 "Respect" Play-by-Play". Sherdog.com. Retrieved January 2, 2009. ↑ Stupp, Dann (February 5, 2008). "Referee Steve Mazzagatti Discusses Lesnar-Mir Fight". MMAJunkie.com. Archived from the original on April 10, 2008. Retrieved March 25, 2008. ↑ Iole, Kevin. "UFC 81: Memorable debut". Sports.yahoo.com. Retrieved December 21, 2015. ↑ "Fight Finder – Frank Mir's Mixed Martial Arts Statistics". Sherdog.com. Retrieved January 2, 2009. ↑ "UFC 81 Bonuses Awards". Mmafrenzy.com. Retrieved December 21, 2015. ↑ Chandler, John. "Mir, Nogueira Tapped as Coaches for "TUF 8"". MMAontap.com. Retrieved January 2, 2009. 1 2 "Coaches announced for season eight of The Ultimate Fighter". UFC.com. May 12, 2008. Archived from the original on October 29, 2008. Retrieved January 2, 2009. ↑ Sloan, Mike. "Pros Picks: Nogueira vs. Mir". Sherdog.com. Retrieved January 2, 2009. ↑ "UFC 91 - Couture vs. Lesnar". Sherdog.com. Retrieved December 21, 2015. 1 2 Meltzer, Dave. "UFC 92: Triple main event". Sports.yahoo.com. Retrieved December 21, 2015. 1 2 "UFC 92 Play-by-Play". Sherdog.com. December 28, 2008. Retrieved January 2, 2009. ↑ Hall, Joe (December 28, 2008). "Evans, Mir Crowned; Rampage Gets Revenge". Sherdog.com. Retrieved January 2, 2009. ↑ Rossen, Jake (December 29, 2008). "In knocking out Antônio Rodrigo Nogueira, Frank Mir shows he still has it". Sports.espn.go.com. Retrieved January 2, 2009. ↑ Rodrigo, Antonio (March 9, 2009). "MMACanada TV: Staph Infection Affected Nogueira's Loss to Mir; Wants to Submit Couture in Their Future Fight". MMACanada.net. Archived from the original on March 11, 2009. Retrieved March 12, 2009. ↑ Rios, Tomas (December 29, 2008). "Unlikely Times, Unlikely Champions: An Early Look at Mir-Lesnar II". Sherdog.com. Retrieved January 2, 2009. ↑ Holland, Jesse (January 2, 2009). "UFC Quick Quote: Frank Mir has no problem with 'Interim' label". MMAmania.com. Retrieved January 9, 2009. ↑ "As UFC 100 beckons, Frank Mir says post-op knee is in great shape". Mmajunkie.com. Archived from the original on March 22, 2009. Retrieved December 21, 2015. ↑ "UFC 100 fight poll results". UFC.com. July 11, 2009. Archived from the original on July 7, 2009. Retrieved October 30, 2009. ↑ "Most Vicious Verbal Attacks in UFC History". Bleacherreport.com. Retrieved December 21, 2015. ↑ "Penn Dominates, Finishes Sanchez at UFC 107". Sherdog.com. December 12, 2009. Retrieved April 12, 2010. ↑ "Frank Mir confident he will get his rubber match against Lesnar". FiveKnuckles.com. Archived from the original on December 16, 2009. Retrieved December 13, 2009. ↑ "Frank Mir Wants Brock Lesnar to Die in the Octagon". Mmafighting.com. Retrieved December 21, 2015. ↑ "Frank Mir issues apology after Brock Lesnar death comments". MMAJUNKIE.com. February 23, 2010. Archived from the original on April 18, 2010. Retrieved April 12, 2010. ↑ "Shane Carwin vs. Frank Mir set for interim title; UFC 111 official for March". mmajunkie.com. Retrieved January 2, 2009. ↑ "UFC 111 Results & Live Play-by-Play". SHERDOG.com. March 27, 2010. Retrieved April 12, 2010. ↑ "Frank Mir is not ruling out going down to Light Heavyweight". LowKick.com. June 6, 2010. Retrieved June 3, 2010. ↑ "Frank Mir vs. Antônio Rodrigo Nogueira II headlines UFC 119 in Indianapolis". mmajunkie.com. July 8, 2010. ↑ "UFC 119: 'Big Nog' Pulls out of his fight against Frank Mir, Cro Cop Steps in". mmaresolutions.com. August 14, 2010. Archived from the original on August 17, 2010. ↑ "UFC 119 winner Frank Mir: A crappy win is better than a crappy loss". Archived from the original on September 28, 2010. Retrieved September 26, 2010. 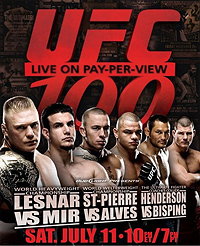 ↑ "Contract issues resolved, Roy Nelson vs. Frank Mir targeted for UFC 130". mmajunkie.com. January 7, 2011. ↑ "UFC 130 main-card results: Mir clobbers Nelson". mmajunkie.com. May 28, 2011. Archived from the original on June 1, 2011. 1 2 "Dana White calls Frank Mir's UFC 140 victory 'submission of the century'". Lasvegassun.com. Retrieved December 21, 2015. ↑ Smith, Michael David (September 7, 2011). "UFC 140: Frank Mir vs. Antônio Rodrigo Nogueira". mmafighting.com. Retrieved September 7, 2011. ↑ "UFC 149: Frank Mir submits Antonio Rodrigo Nogueira". mmafighting.com. December 10, 2011. ↑ "UFC 140 pictures and xray: Minotauro Nogueira submitted for the first tim in his MMA career, Frank Mir breaks arm in two". mmafight.com. December 11, 2011. Archived from the original on April 2, 2015. ↑ "UFC 140 Live Results and Play-by-Play". sherdog.com. December 10, 2011. Retrieved September 10, 2011. ↑ "UFC 140 bonuses: Jung, Mir, Jones, Machida earn $75K awards". mmajunkie.com. December 11, 2011. ↑ "Cain Velasquez vs. Frank Mir title-eliminator added to UFC 146". MMAjunkie.com. March 7, 2012. Archived from the original on March 9, 2012. Retrieved March 7, 2012. ↑ "'UFC Primetime' returns to FX for 'UFC 146: dos Santos vs. Mir'". MMAjunkie.com. May 2, 2012. Archived from the original on May 4, 2012. 1 2 "UFC 146 Results: 'Dos Santos vs. Mir' Live Play-by-play". Sherdog.com. Retrieved December 21, 2015. ↑ Okamoto, Brett (August 7, 2012). "Fertitta: Crossover a 'one-time' deal". espn.go.com. Retrieved August 7, 2012. ↑ Meltzer, Dave (September 3, 2012). "Mir vs. Cormier Heavyweight Showdown to Take Place Nov. 3". MMAFighting.com. Retrieved September 3, 2012. ↑ "Former UFC Champion Frank Mir Forced From Strikeforce Fight Against Daniel Cormier Due To Injury". BloodyElbow.com. September 19, 2012. Retrieved September 19, 2012. ↑ Mookie Alexander (January 15, 2013). "Frank Mir vs. Daniel Cormier set for UFC on FOX 7 in San Jose". bloodyelbow.com. Retrieved January 15, 2013. ↑ "UFC on FOX 7 Results: Henderson vs. Melendez". MMA Fighting. ↑ Thomas Myers (May 29, 2013). "Frank Mir vs Josh Barnett fight set for UFC 164 in Milwaukee". mmamania.com. Retrieved May 29, 2013. ↑ "Josh Barnett Feels Frank Mir's Complaints Have Cheapened UFC 164 Win". Sherdog. ↑ Matt Erickson (September 5, 2013). "Frank Mir, Alistair Overeem added to November's UFC 167 in Las Vegas". mmajunkie.com. Retrieved September 5, 2013. ↑ Brett Okamoto (October 3, 2013). "Mir-Overeem fight moved to Feb. 1". espn.go..com. Retrieved October 3, 2013. ↑ Staff (November 12, 2014). "Frank Mir vs. Antonio Silva set for UFC 184 in Los Angeles". mmajunkie.com. Retrieved November 12, 2014. ↑ Ariel Helwani (January 7, 2015). "Frank Mir vs. Antonio Silva moved to Feb. 22 following Glover Teixeira knee injury". mmafighting.com. Retrieved January 7, 2015. ↑ Steven Marrocco (February 22, 2015). "UFC Fight Night 61 results: Frank Mir concludes night of upsets, KOs Antonio Silva". mmajunkie.com. Retrieved February 22, 2015. ↑ Staff (February 22, 2015). "UFC Fight Night 61 bonuses: Frank Mir leads quartet of 'Performance of the Night' winners". mmajunkie.com. Retrieved February 22, 2015. ↑ MMAjunkie Staff (April 8, 2015). "Todd Duffee gets wish vs. Frank Mir in UFC Fight Night 71 headliner in San Diego". mmajunkie.com. Retrieved April 8, 2015. ↑ Dave Doyle (July 16, 2015). "UFC Fight Night 71 results: Frank Mir knocks out Todd Duffee in first round". mmafighting.com. Retrieved July 16, 2015. ↑ Staff (July 16, 2015). "UFC Fight Night 71 bonuses: Frank Mir's crushing KO nets him $50,000". mmajunkie.com. Retrieved July 16, 2015. ↑ Chuck Mindenhall (August 1, 2015). "Frank Mir versus Andrei Arlovski official as co-main event for UFC 191 on Sept. 5". mmafighting.com. Retrieved August 1, 2015. ↑ Ben Fowlkes (September 6, 2015). "UFC 191 results: Andrei Arlovski makes it six straight with decision over Frank Mir". mmajunkie.com. Retrieved September 6, 2015. ↑ Mike Bohn (September 6, 2015). "Dana White thought Frank Mir won UFC 191 co-headliner against Andrei Arlovski". mmajunkie.com. Retrieved September 6, 2015. ↑ "Arlovski defeats Mir". MMA Decisions. Retrieved December 31, 2015. ↑ Nathan Ryan (January 8, 2016). "Mark Hunt v Frank Mir: UFC heavyweight blockbuster confirmed for Brisbane in March". foxsports.com.au. Retrieved January 8, 2016. ↑ Steven Marrocco (March 20, 2016). "UFC Fight Night 85: Mark Hunt gets another walk-off KO, stops Frank Mir in first". mmajunkie.com. Retrieved March 20, 2016. ↑ "Please read my statement regarding USADA test:". mobypicture.com. Retrieved April 9, 2016. ↑ "Frank Mir still likes Brock Lesnar trilogy: 'It makes a lot more sense than some other fights'". bloodyelbow.com. Retrieved January 24, 2016. ↑ "Former heavyweight champion Frank Mir granted release from UFC". bloodyelbow.com. July 9, 2017. Retrieved July 9, 2017. ↑ Marc Raimondi (March 7, 2019). "Frank Mir says he's considering legal action against USADA". mmafighting.com. ↑ "Frank Mir Signs Contract with Bellator MMA, Says He's Getting Paid More Than He Ever Did in the UFC". ↑ "Fedor Emelianenko vs. Frank Mir targeted for Bellator heavyweight tournament". MMA Fighting. Retrieved November 22, 2017. ↑ "Bellator 198 results: Fedor Emelianenko stuns Frank Mir with first-round TKO". MMAjunkie. April 29, 2018. Retrieved April 29, 2018. ↑ John Morgan (October 11, 2018). "Brent Primus vs. Michael Chandler rematch headlines new Bellator 'Salute the Troops' event in Hawaii". mmajunkie.com. ↑ "Bellator 212 results: Primus vs Chandler 2". mmafighting.com. December 15, 2018. ↑ "Frank Mir's First Wrestling Opponent Announced". WrestleZone. Retrieved March 20, 2019. ↑ "Mir jokes about new baby boy, serious about Lesnar". LASVEGASSUN.com. June 30, 2009. Retrieved June 30, 2009. ↑ "Mir makes his own breaks: Ex-UFCs champion has battled his way back into contention". ReviewJournal.com. February 1, 2008. Retrieved January 16, 2009. ↑ "Openly Atheist fighter in the UFC". TheGoodAtheist.net. August 19, 2009. Archived from the original on December 15, 2010. Retrieved August 20, 2009. ↑ "UFC 146 Live Chat: Frank Mir". CoveritLive. May 23, 2012. Retrieved October 17, 2012. ↑ "Frank Mir is a vegetarian". MixedMartialArts.com. September 24, 2010. Retrieved December 12, 2011. ↑ Erickson, Matt (May 27, 2011). "Off yearlong vegetarian diet experiment, Frank Mir feels stronger for UFC 130". MMAFighting.com. Retrieved December 12, 2011. ↑ Gross, Josh (June 2, 2012). "Mir receives exemption for TRT0". ESPN. Retrieved May 20, 2013. ↑ Iole, Kevin (January 31, 2008). "Mir has seen, done it all". Yahoo! Sports. Retrieved January 2, 2009. ↑ Collozo Jr., Arturo (February 4, 2008). "Frank Mir Loss Aside: Don't Count Out Brock Lesnar". Nationalledger.com. Archived from the original on December 16, 2012. Retrieved January 2, 2009. ↑ Steve Carp (January 28, 2016). "Southern Nevada Sports Hall of Fame to induct first MMA fighter". reviewjournal.com. Retrieved January 28, 2016. ↑ Thomas Gerbasi (January 28, 2016). "Frank Mir selected to Southern Nevada Sports Hall of Fame". ufc.com. Retrieved January 28, 2016. ↑ "Stephan Bonnar Permanently Replaces Frank Mir as WEC Color Commentator". Watchkalibrun.com. Archived from the original on April 12, 2010. Retrieved December 21, 2015. ↑ "Frank Mir's WEC status uncertain, hopes to take part in future broadcasts". mmajunkie.com. Archived from the original on July 18, 2012. Retrieved July 16, 2012. ↑ Villagracia, Reuben (June 15, 2012). "Mir, McIvor set sights on future". chroniclejournal.com. Archived from the original on January 19, 2013. ↑ "Frank Mir Wants to Go into Commentary When He Retires from the UFC". bleacherreport.com. June 15, 2012. ↑ "Frank Mir has become a new ACB pundit". allfight.ru. Retrieved October 17, 2015. ↑ mmaworld_10 months ago. "Frank Mir vs Roberto Traven - UFC 34 - November 2, 2001 - ExploreGram". Explore instagram online – ExploreGram. ↑ "Nogueira, Sylvia, Lytle and Mir earn $60,000 UFC 81 "Fight Night" bonuses". mmajunkie.com. February 3, 2008. ↑ "UFC 140 bonuses: Jones, Machida, Mir, 'Zombie' net $75K apiece". sherdog.com. December 11, 2011. ↑ "UFC Fight Night bonuses: Mir, Alvey, Reneau, Dwyer earn $50K in Porto Alegre". sherdog.com. February 22, 2015. ↑ "Most wins in UFC bouts". Fightmatrix.com. Retrieved December 21, 2015. ↑ "Most UFC bouts". Fightmatrix.com. Retrieved December 21, 2015. ↑ "Ten Best – 2011 Submission of the Year". ufc.com. January 5, 2012. ↑ "2008 FIGHT! Awards". FIGHT! Magazine. May 11, 2008. Archived from the original on October 4, 2011. Retrieved October 28, 2011. ↑ "Sherdog's Miscellaneous Awards for 2008". Sherdog.com. Retrieved December 21, 2015. ↑ "Sherdog's 2011 Submission of the Year". Sherdog.com. January 11, 2012. ↑ "Second Team". Sherdog.com. Retrieved December 21, 2015. ↑ "Imagining an MMA Hall of Fame: Best of the Rest". Sherdog.com. Retrieved December 21, 2015. ↑ "ESPN 2011 MMA Awards". Espn.go.com. Retrieved December 21, 2015. 1 2 "2012 World MMA Awards". Mmamania.com. Retrieved December 21, 2015. Wikimedia Commons has media related to Frank Mir .